Now, here's the thing. I don't really have any dark spots. The occasional pimple (be it inflamed, a whitehead or a blackhead), sure. Dryness and roughness, especially during the winter months, definitely. But dark spots? Luckily, I've been blessed to go through life without them. So it came as a definite surprise to me when Kiehl's Clearly Corrective Dark Spot Solution worked absolute wonders on my skin. I've been using this serum for about a month now, and I've seen a wondrous difference in how amazing my skin has been looking and feeling. My skin tone is more even, especially near my nose where I tend to get broken capillaries, and it just looks more radiant and glowy overall. On days where I do have an angry red spot on my face, the serum works to make it look much less intense than it actually is. This serum is formulated with three powerful ingredients that really work to make skin look and feel its best. It contains Activated C (which attacks deep-set dark spots and prevents new ones from being formed), White Birch Extract (a sugar-derived ingredient that restores hydration and nutrients to the skin and increases collagen production) and Peony Extract (which works with Activated C to reverse discoloration). I love the rich texture of the serum -- it's a bit heavier than others I've tried, but it slicks easily onto skin and sinks in immediately. I love that there's no greasiness or stickiness left behind, only a seemingly lit-from-within glow and supple softness. Plus, the eyedropper fills up with just enough product to cover the face -- not too little, not too much, just the perfect amount. Simply put? My skin looks and feels better than it has in weeks. 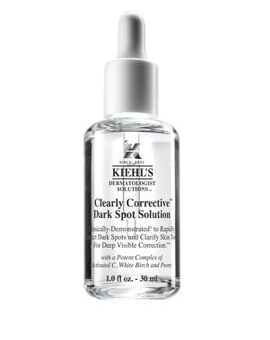 Kiehl's Clearly Corrective Dark Spot Solution retails for $49.50 at kiehls.com.